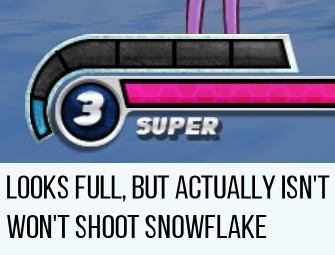 There's this one thing that causes me a lot of frustration: sometimes a section of the magic meter will appear to be full but it really isn't, probably missing less than a pixel so the game can't show it; and since I'm very reliant on the snowflakes sometimes it completely messes my combos up, I'm sure you all know missing just one step can lead to a defeat. I would love to have better visual feebdack of the actual status of my magic, maybe some sort of colour difference between when a section is charging and when it is actually charged. As is I have to wait for the next one to start visibly filling up to be sure the previous one is actually full, not really optimal. This is an excellent idea. I think right now, they briefly flash when they fill, but that's an effect that's a bit subtle and can be missed in the heat of the moment. A different color would be really useful for being able to tell at a glance for characters like Tian and Velvet. And while I'd say Tianhuos little flash is a step in the right direction, I don't think the same thing would work with Velvet since she has more charges, which are WAY smaller, and we're not continuously staring at the meter, two different colours would be the best solution imho.